Without further ado, here is the cookie recipe we tailored for the 2012 Visions of Sugar Plums B&B Cookie Tour, in which Black Mountain area B&Bs opened their doors for cookie tourgoers to sample different cookies and view all the Christmas and holiday decorations, all to benefit a great charity, the Swannanoa Valley Christian Ministry. 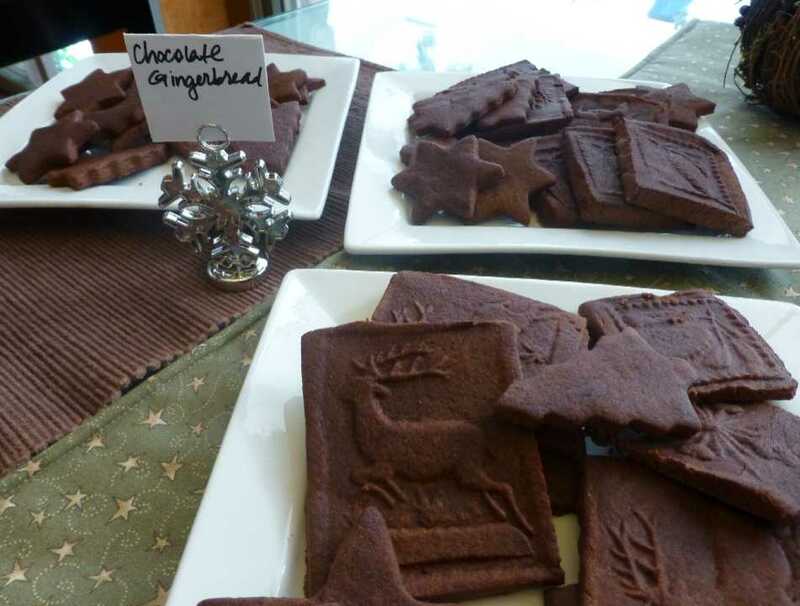 Our theme may need to be “chocolate” for future cookie tours…our concoction last year, Mint Chocolate Chip Cookies, was pretty popular, too! 1. Whisk together the first seven ingredients in a large bowl. 2. In an electric mixer, cream butter and sugar together. 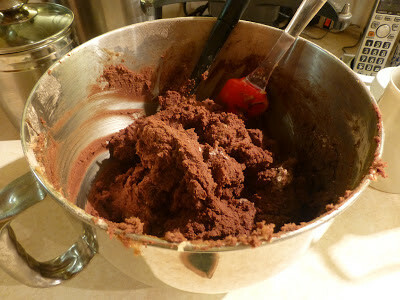 Add egg, then milk, then molasses, mixing until well blended. 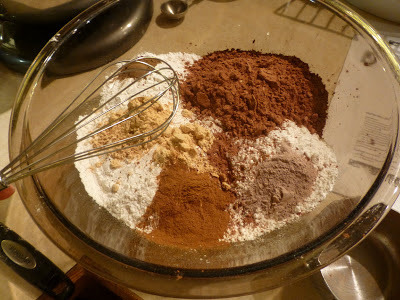 Add flour mix and blend well. 4. 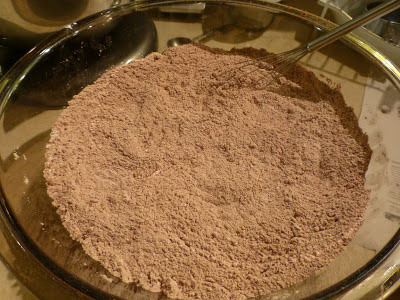 Dust rolling surface with cocoa powder and, taking a quarter of the dough at at time, roll dough to 3/8 inch thickness with a rolling pin. [If dough becomes too soft to work with, refrigerate for another 30 minutes.] Use cookie press or cookie cutters to press or cut cookies into desired shapes. If using a press, it may be necessary to chill pressed dough for another 10 minutes before cutting the dough into individual cookies. 5. Bake cookies 1/2 to 1 inch apart on cookie sheets for 10-12 minutes, until cookies are just soft to the touch and fragrant. Cool for 2 minutes on sheet, then transfer to wire racks to cool completely. Enjoy! 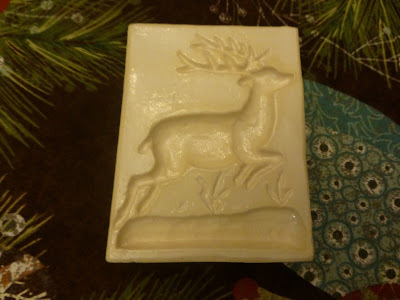 For cookie presses, we ordered this awesome food mold through the Butterstamp Workshop, located in Maine, which we found while searching for recipe ideas online. 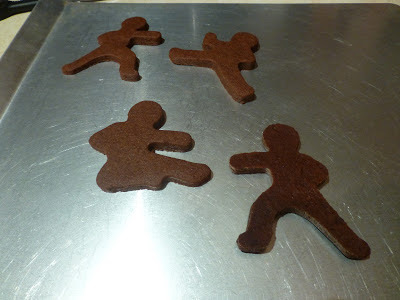 For cookie cutters, we used Christmas trees and stars for the tour, but we also happen to have “ninjabread men“ cookie cutters and decided to make some of those as well! Just in case you need some ninja fun for the holidays!